Held at the Town Gazebo, Main Street, Randolph, proceeds from our annual plant sale help fund our Vermont Tech Horticulture and Ornamental Landscaping Scholarship. Members of the club spend weeks leading up to the sale digging and potting plants from their gardens. Plants are competitively priced, and garden club members are on hand to give tips on the planting and care of each plant. "Like" our Facebook page to keep up with special events. Please note, posters are from past events just to suggest the spirit of the event. Dates are not current. RAGC's much-anticipated themed flower show is fun for the whole community. 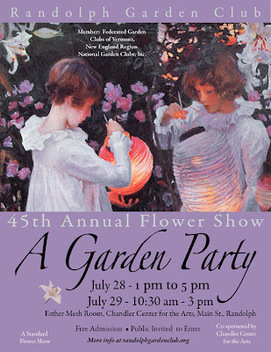 The show is a Standard Flower Show, conforming to standards established by National Garden Clubs, Inc. Members and non-members alike are invited to participate. The next flower show date is TBA. 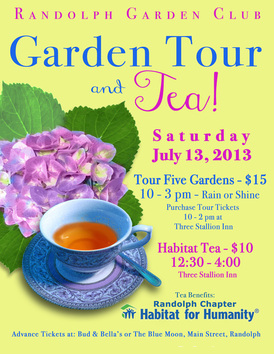 Admire the gardening talents of great local gardeners on the garden tour. Follow us on Facebook to get updates about the next garden tour. Maybe you have a great garden you'd like to have included on our tour? Contact us via our FB page or via the email icon at the top of this page.